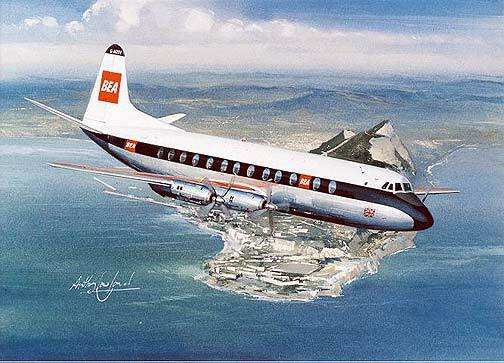 A BEA Vickers Viscount prepares to land at Gibraltar. Probably the most successful airliner that Britain ever produced. A BEA Vickers Viscount prepares to land at Gibraltar. Probably the most successful airliner that Britain ever produced. This print by the artist Anthony Cowland is a stunning image of this fine aircraft. A limited edition print of 250 signed and numbered by the artist Anthony Cowland G.Av.A.